Noun: An outgoing, socially confident person. Noun: A shy, reticent person. So we largely define extroverts as socially confident and outward-looking and introverts as socially reticent and inward-looking. Broadly, this is fine as a way to describe how we generally behave, as long as we don’t lose sight of the fact that introvert and extrovert are just words to describe collections of traits. They aren’t a binary that everyone must conform to, and not everyone can be neatly described as one or the other. 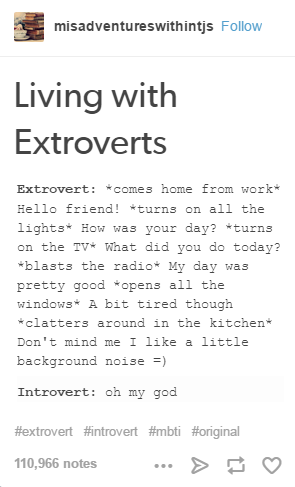 I, for example, am pretty extroverted. I host open mic evenings, I perform, I’m loud and confident and I thrive in social situations. I get sad if I’m alone too much and I’m quite prone to feeling lonely. However, in many situations, because of my anxiety (more on this later), I also occasionally fear large crowds and crave solitude. I often enjoy solitary pursuits, such as writing creatively, reading books and gaming. I also like going to the cinema or theatre alone and enjoy quiet nights in by myself. If I socialise relentlessly I feel ‘burnt out’ and need a cave day to recover. I’m very inward looking and contemplative. Depending on the day, my mood, my mental health – a whole host of factors, actually – I could be described by a stranger as fitting either role perfectly. There’s a strange trend online of self-described introverts writing about introversion as if it’s a virtue. It’s not a negative thing – it has no intrinsic worth, it’s just a group of traits united by a word, same as extroversion. 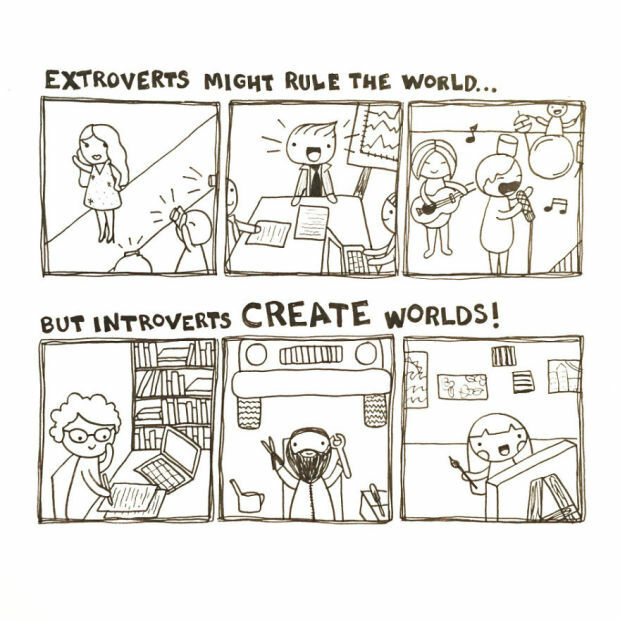 There’s a definite introvert superiority complex that seeks to portray introverts as the only people with complex inner lives, as wan, tea-drinking bookworms in comfy jumpers being quiet and special, and extroverts as unsophisticated, loud, drooling apes. It’s bizarre, frankly, the same sort of inferiority superiority complex that leads to mean-spirited ‘nerd pride’ sneering at people who engage with popular culture and play sports. It’s very high school, as if extroverts are some imagined jock populace, strutting around braying, bouncing basketballs and threatening you with a swirly. I’m what would broadly be defined as an extrovert, but I have severe anxiety and have experienced all of the things in the bullet list many, many times. My problems are not less important, and I am not less emotionally fragile/more robust, just because I appear to be confident and fun. These things – reading, relaxing, thought – are not the sole preserve of introverts and to suggest they are implies that they think extroverts are, what? Unthinking, loud social animals who don’t read books and just bellow whatever comes into their head at all times? This is the problem that comes from creating a false dichotomy: the idea that some things are for certain people and not others. If I’m an introvert and I’m thoughtful, then as an extrovert you aren’t. The reading thing crops up over and over again, and it’s telling of a larger problem: instead of simply describing ways people gain/expend energy and the size of groups they prefer, it’s tying the idea of intellectual superiority into introversion. 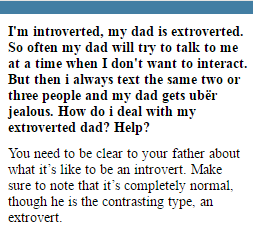 Here’s an example of introversion being pathologised. It’s fine to say “I don’t have much social energy right now”, of course, but I think the hand-wringing pleas for acceptance are often a bit much. 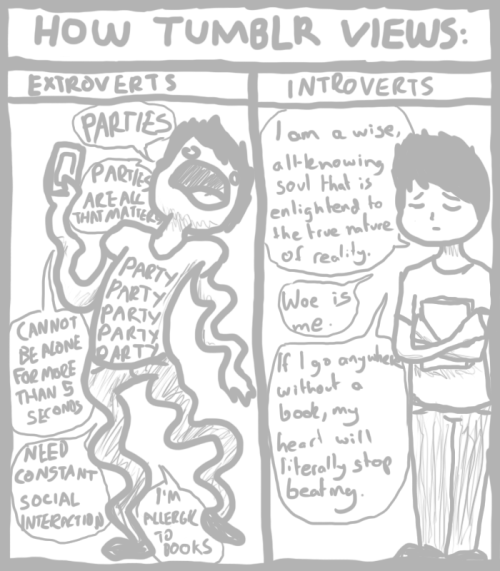 Introversion isn’t a mental illness, it’s just a preference with regards to interaction. Everyone should be treated with respect, of course, but I challenge you not to laugh at bit at people talking about being introverted as if they’re discussing like, being gay or something. “Knowing the patterns that make up our personality can be a useful shortcut for working through the affect of any given moment. The pattern can become a reliable cue to let go of an identification that is giving rise to discomfort, dissatisfaction, or distress. Beyond this cueing function, there is not much of value in the pattern. This is a radical statement and one that contrasts with the valorizing of the introvert personality. I believe it is important for introverts to recognize their strengths and engage in good self-care. However, all beings—introverts and extroverts alike—will have to move beyond the label of self, personality, and story”. In summary: ‘introvert’ and ‘extrovert’ are broad terms to describe traits, rather than binary definitions of how all people function in society. Some people need more time alone to reflect and gain energy, and some people prefer more social contact, and both are of the same moral worth. Introverts aren’t inferior to extroverts, but they also aren’t (as the dominant online narrative would have it) intellectually superior, more emotionally developed beings who have any right to sneer at or feel better than people broadly defined as ‘extroverts’. Stop being mean jerks, everyone. Next Next post: Roundup of links!